To live confidently in retirement, you need a financial plan you can understand. The last thing you need from your financial plan is confusion! 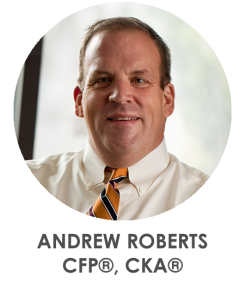 With more than 20 years of experience in the investment management industry, Andrew Roberts enjoys clarifying even the most complex investment, estate, tax or retirement situations into a plan you can truly understand and follow. Andrew and his wife, Kim, live in Grandville, Michigan. As parents of four active and growing children, they stay busy supporting their children in their sporting and extracurricular activities. They are also active members of their church, Harvest Orthodox Presbyterian. In his free time, Andy enjoys swimming and has completed various open-water swimming events.